Synopsis: Ivory hunter Allan Quatermain is hired to track down the missing brother of a British aristocrat who set off in search of diamond mines owned by the biblical King Solomon and was never seen again. Review: I watched the 1950 movie based off of this book some time ago. But, while I remember liking the film, I couldn't remember much about the overall plot. So, when I finally had a chance to read the book over the past couple of weeks, I did so without knowing what to expect. At first, I wasn't really sure I would like this book. 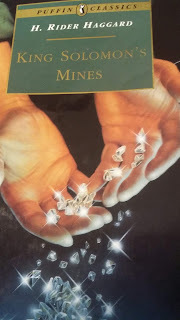 This is because it took a little while to get started and, for a while, I thought the story was going to be about Quatermain and his group hunting elephants until they stumbled upon the diamond mines. But, as the book progressed, it did manage to get much more interesting, with the hunter and his companions facing death by thirst in a desert, death by starvation on a mountain and, ultimately, death by spear when they come across an ancient and isolated African tribe while journeying to the diamond mines that may or may not exist in search of a man who probably died long before he made it there. There are some parts of the book that do end up being somewhat predictable. His servant, Umbopa, for example, was somewhat mysterious when he was first introduced. But, once they found that ancient civilization and were given a bit of history about its king, it wasn't too difficult to figure out the servant's real identity. However, despite this, there were plenty of things about this book that managed to keep it exciting. I especially loved the part about the friends being mistaken as god-like entities (and having to play the role to avoid being killed) and, ultimately, getting drafted into a civil war as a result. It was difficult to tell who would survive (other than Quatermain, who was the narrator) or if they would even end up on the winning side. The book also managed to keep some mysteries until the very end as well. This included the whereabouts of the missing brother and why, if the diamond mines had been found, nobody ever managed to bring diamonds back from them. This kept me reading, even during the predictable parts, just because I wanted answers about those. Final Opinion: The book starts off a little slow. But, once it gets going, it is an entertaining story and one I would recommend reading.